The latest from KEF are designed to make high-end sound affordable. A trend that we've been seeing a lot of recently is the production of less expensive speakers by high end makers. KEF is no exception, and endeavors to bring audiophile sound to those who would previously be unable to afford it. The R series is made of nine speakers - two floorstanding, two bookshelf, two center channels, two surrounds and a 500 watt subwoofer. They all boast a similar black and aluminum style, with the subwoofer in particular embracing the look. KEF says that their new Uni-Q MF/HF driver array keeps the midrange sounding like it should. The midrange drivers use magnesium/aluminum alloy cones and a decoupled aluminum chassis. Tweeter design is borrowed from the KEF Blade. 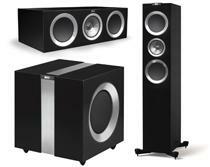 The KEF R Series will be available in October 2011.